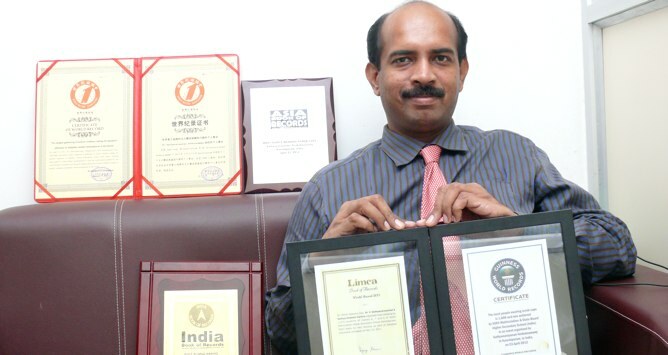 Dr. V Sathyanarayanan, a Guinness World Record holder for Diabetes Awareness, is a Diabetologist and Physician based in Kanchipuram, practising at the Sathya Diabetic Centre and Dental Clinic, and fondly referred to by locals as the "Doctor of the Poor". Dr V Sathyanarayanan completed his MBBS at Chengalpattu Medical College in 1994 and went on to do his MD (General Medicine) at the Stanley Medical College from 1998-2001. He also has to his credit a Certificate Course in Diabetology from the University of Newcastle, Australia. He has worked as an Assistant Professor of Medicine at the prestigious Madras Medical College and Government General Hospital, Chennai, from 2001 to 2003. Dr. Sathyanarayanan is known for his innovative ideas of creating and spreading Diabetes awareness, for which he bagged two Guinness World Record certificates in 2012 and 2013. His work in this field has been appreciated by His Excellency President of India Shri Pranab Mukherjee and the former president of India Dr. A P J Abdul Kalam. He also has got certificates from the Limca Book of Records, Asia Book of Records, India Book of Records and World Record Association for various Diabetes Awareness Programmes. Case Report: Acute Fatty Liver of Pregnancy. Tropical Gastroenterology. Aug-Sep 2003. Member, EASD (European Association for the Study of Diabetes). © 2018, Dr. Sathyanarayanan Venkataswamy.